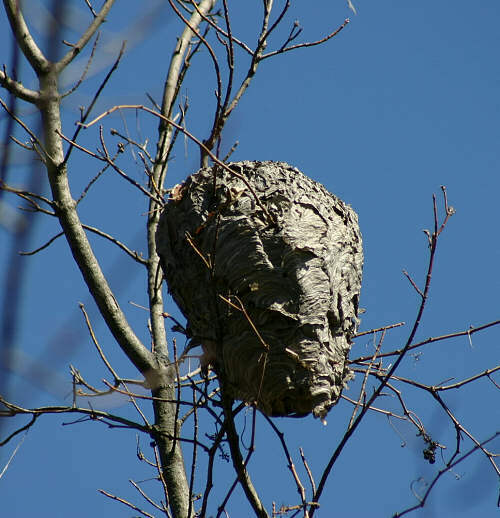 We hadn't noticed this spectacular wasp nest until all the leaves fell off the tree. It is about 16" long and about 30 feet up. It is a nest of the Bald Faced Hornet which is a frequent visitor at "Beer Time" and seems to like crawling into a glass and drinking a little. Other than that, we have never been stung or bothered by them. However, they are known to be very protective of young and nests and get very nasty when disturbed on their turf. It didn't occur to me to photograph one when I had the chance so it will have to wait for warm weather to complete this page. 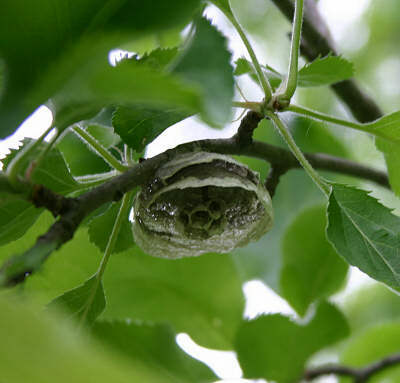 This is the very beginning of a Bald Faced Hornet's nest being started in an apple tree at about eye level, making it easy to photograph. It never amounted to anything as is typical of nest building in general, but it gives a good idea of how the above one started.